This easy-to-use hand pump pressurized cleaning tank keeps your beer tasting brewery fresh! 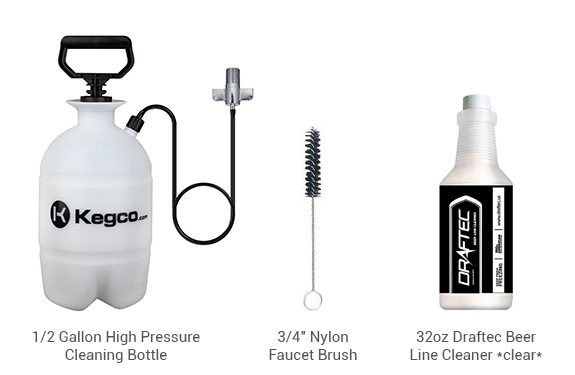 Introducing the Draftec Deluxe Hand Pump Pressurized Cleaning Kit! This kit saves the life of your tower without requiring you to remove the faucet - just unscrew the beer line off of the keg coupler, and screw it directly to this cleaning kit! Includes a High Pressure Hand Pump Cleaning Bottle, a 32 oz. Bottle of Draftec Advanced Draft Beer Cleaner Clear, and a Nylon Beer Faucet Brush. The 1/2 Gallon Cleaning Bottle holds plenty of cleaning solution for you to keep your draft beer lines clean. Draftec Advanced Beer Line Cleaner will clean the most stubborn draft lines. Its proprietary formulation was designed to attack not only the beer stone, but every element of beer line soils. Use the nylon faucet brush to keep your tap clean. The 1/2 Gallon Cleaning Bottle holds plenty of cleaning solution for you to keep your draft beer lines clean. The Hand Pump pressurizes the cleaner to easily go through your beer hose and out the beer faucet tap without removing the faucet! Draftec Advanced Beer Line Cleaner will clean the most stubborn draft lines. Its proprietary formulation was designed to attack not only the beer stone, but every element of beer line soils. Used as directed, Draftec Beer Line Cleaner will eliminate mineral crystals, hops, resins, proteins, carbohydrates, and bio films that are embedded or adhere to the polymers of the beer tubing. Manufactured in the US. Use the nylon faucet brush to keep your tap clean and keep mold from growing on your draft beer equipment. 3/4" Diameter x 3" Brush Length x 8-1/2" Overall Length.